I used to spend a fortune on those foaming soap dispensers filled with Dawn dishwashing soap! Seriously. They’re so darned convenient that I quickly became addicted. I was always on the hunt for good deals on little bottles of Dawn foaming dish soap. When the soap ran out and the bottles became empty, I would just toss the bottle and replace it with a new one. 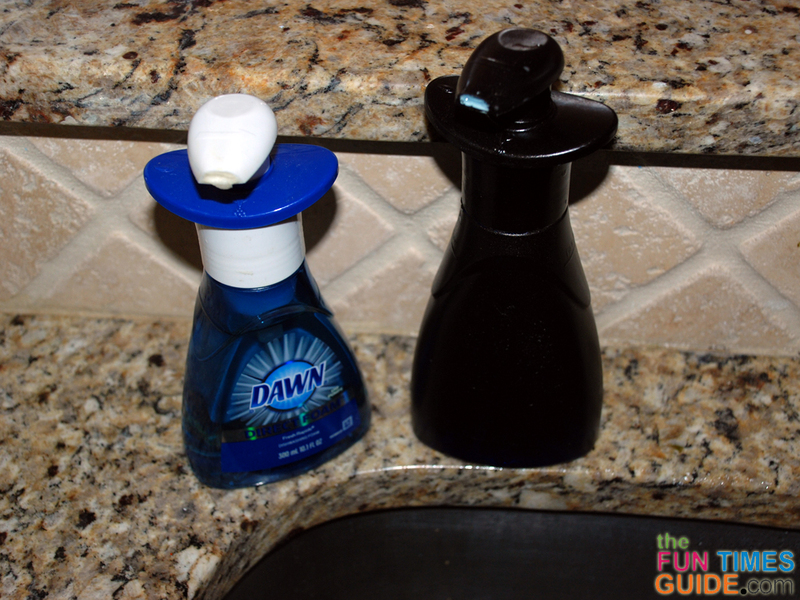 For awhile, I was thrilled to actually find Dawn foaming soap refill bottles. They weren’t nearly as large or economical as the regular Dawn dish soap that I used to buy at Costco (before I discovered the foaming pump bottles). But the refill bottles were a godsend for me — because it meant I didn’t have to throw away all of those little pump dispenser bottles anymore! However, for some reason, the refill bottles of Dawn foaming soap have begun to disappear from store shelves. I have no idea why. I love this stuff! Surely other people do too. But I can’t find anywhere locally to buy it anymore. 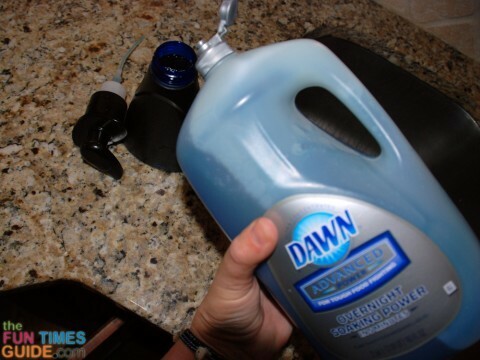 Here’s why: people have figured out a way to make their own foaming soap to put inside those small Dawn pump bottles! Yessireee. I am thrilled to report that you can, indeed, make your own foaming soap. Here’s how you can too. Plus ideas for thinking beyond the kitchen and making foam soap for your bathroom sinks, for hair shampoo, even for dog shampoo! Also, see how to make your foaming soap bottles look much more attractive on the counter. This recipe to make homemade foaming baby wash was my inspiration for this project. I figured if it worked so easily using regular baby wash, then maybe it would work similarly with other liquid soaps. I decided to start with the regular, old-fashioned bottle of Dawn dishwashing detergent. Here’s the secret: Don’t use much dishwashing liquid. A ratio of about 90% water and 10% soap is what you’re after. And don’t shake to mix it up. Just let the water and soap meld together on their own. The first time I tried it, I used way too much dish soap — probably a 50/50 ratio of soap to water. That didn’t work well at all. The soap came out of the pump looking much like it looks when you pour it out of the big bottle: blue and concentrated; not white and foamy. So I emptied my pump bottle and started over from scratch. This time I put only about a half inch of the Dawn soap into the pump bottle, and filled the rest of the bottle with plain water. That was the perfect combination. I’ve refilled 2 separate bottles with my homemade foaming soap so far. Both continue to work perfectly. TIP: Don’t overfill the pump bottle. You need to leave enough room for that large pump contraption to still fit inside the bottle along with the soap & water. Dishwashing soap for your kitchen isn’t the only thing that can be refilled in your old foam soap pump bottles. You can refill pump bottles with any liquid soap just as easily — even shampoos — as long as they’re not too thick. Here’s a fun idea: If you bought a bottle of “regular” liquid soap because you happen to like the scent, but not the size, shape, or color of the bottle, then just transfer a little bit of it into a foam pump bottle that you like — along with some water. You’ll now have foam soap in a scent you love, a bottle that’s attractive, and you’ll get 4 to 9 times more soap in the long run (since you’ve diluted it with water to turn it into a foam). That’s a lot more pumps than you would get if you used it as a traditional liquid soap! What a great money-saving idea — especially if your favorite liquid soap happens to be fairly expensive. Don’t limit yourself to just using foam soap in the kitchen though. You can also make foaming hand soap for your bathrooms and powder rooms too. 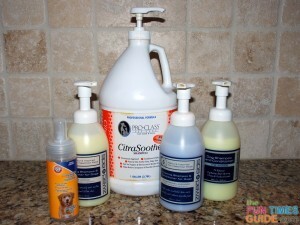 And if you have pets, you can even transfer “regular” pet shampoo into a foam pump bottle. I’ve found that it’s much easier to bathe my dog using a thicker foam shampoo than it is to use a runny liquid shampoo. It lathers in his coat faster. It’s easier to put it right where you want it on the dog’s body. There’s little to no waste since it does’t drip and slip through your fingers when applying it to the dog’s coat. And I get many more uses from each bottle of dog shampoo that I buy! Just remember to use that important formula of 10% product to 90% water when you’re mixing a liquid soap (or shampoo) with water to make a foam soap. I’ve heard that others have had success with a 25% ratio (1/4 soap and 3/4 water), but that just uses more product than you need in my opinion. (When using Dawn dish soap anyway.) The less soap it takes to make it foam, the more money you’re saving in the long run. NOTE: Some soaps may have more or less water already in them. Therefore, the exact ratio of soap-to-water may be different, depending on the liquid soap or shampoo you’re using. So feel free to experiment a little to find the combination of soap-to-water that works best for you. It’s safe to say you should always use more water than soap though. Since I love how convenient this is for washing hands (and dishes) in the kitchen, next I plan to do the same thing for each bathroom sink in our house. I have a few empty Dawn foam soap bottles that are just waiting to be painted to match each bathroom’s unique decor. I’m thinking of getting a couple of other foam pump bottles too (rather than having all of the soap dispensers in our home look like painted Dawn soap bottles). Foam soap pumps work differently than most other pump dispensers. Dawn’s foaming soap pump bottles aren’t the only ones you can refill with your own homemade foam soap. For example, I have a unique pump bottle that once held Spaw Essentials foaming dog shampoo. It makes a great man-size soap dispenser that we keep in the garage. When the product is used up, simply refill the foam pump bottles with your own liquid soap and water recipe. Those are some of the most unique pump bottles that you can use for your homemade foaming soap. Find the size and shape you like, then spray paint it to match your room’s decor! Rubber Band Etching Technique — spray paint 1 color first, add rubber bands, then paint another color. Transparent Tape Technique — apply tape to the bottle before spray painting. Chalkboard Paint Technique — yes, chalkboard paint can be used on plastic bottles too! For the most part, I have no problem leaving the pump bottles alone with their original product details covering the front and back of the bottle. But if you’ve got some time to kill and you’re feeling a little crafty, then do what I did: spray paint your foaming soap pump bottles in fun colors! That’s right, you can paint them whatever color you choose — to match your room’s decor. It looks great because our entire house is accented with this color — from the light fixtures and hardware that were here when we moved in, to the home decor and accessories that I’ve added myself. TIP: Be sure to spray the entire bottle and pump (while it’s firmly secured in the bottle itself) from all angles. Otherwise, you’ll see tiny specks of white in all the spaces you missed!